financial year. Application will be filled in a Plain paper with recent passport size photo duly attested by gazette officer along with all required information and attested documents to be reachable to Jhajjar District Court on or before 20-11-2017 by 05:00 Pm through registered/speed post or by hand. Selection for Jhajjar District Process Server and Peon Jobs will based on performance in Interview only. 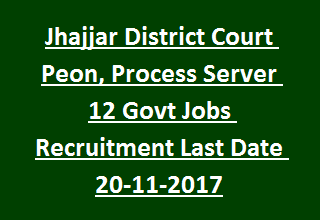 Complete details of Jhajjar District Process Server, Peon Jobs Recruitment details are given below. Last date for Application form submission is 20-11-2017. Jhajjar District Court currently recruiting 12 temporary vacancies. Post Name and number of vacancy details are given below. As on 01-01-2017 candidates upper age limit is 42 Years and lower age limit is 18 Years. Upper age limit relaxations will be given for reserved candidates as per the norms of Punjab High Court or Government of Punjab. Interview Dates will be informed later in Jhajjar District Court Website. Mention all your information in a plain paper with recent passport size photo duly attested by Gazetted Officer. And also attach the attested copies of all relevant testimonials and three pass port size photos. Attach two self addressed covers with duly stamped along with application form. Application form is available in official recruitment notification of Jhajjar District Court. Filled application form has to reach District Court of Jhajjar is on or before 20-11-2017.